• 23 October 2011 – Congratulations to Mr Bernard Lee of Horizon Stable whose “Always Certain” landed his first Group 1 win in the $500,000 Group 1 Raffles Cup 1800m. 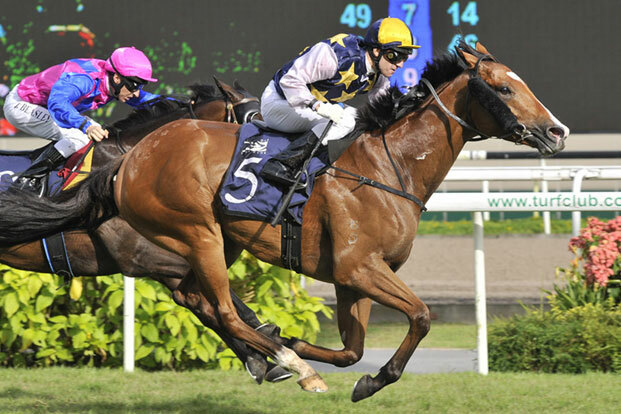 “Always Certain”, who is from Akaaber mare “Akarana”, landed his seventh career win and took his prizemoney past the $1 million mark for Mr Bernard Lee. Jockey Duric exclaimed that “Always Certain” certainly deserved this Group 1 win after chasing “Better Than Ever” in all those previous Group 1 races. 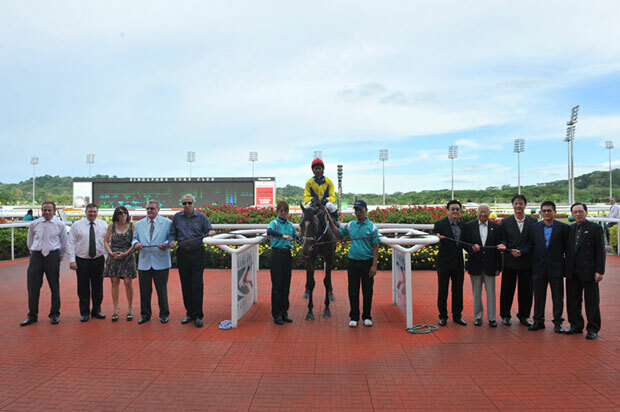 • 2 October 2011 – Congratulations to Mr Tang Weng Fei of Jupiter Stable whose "Better Than Ever" claimed his second successive Kranji Mile in a fantastic run in the $500,000 Group 1 Panasonic Kranji Mile 1600m. Jockey Samiee Jumaat expertly piloted his regular mount down the home straight to claim victory by a head over "Clear for Action" ridden by Danny Beasley. The NZ bred 5 year old by “French Deputy” from “Songfest” has now notched up an impressive 15 wins from 21 starts and taken his prize money over the $2.5 million mark for the Jupiter Stable. • 27 Sep 2011 – TOAST Trust No. 13 had been terminated officially on 30 Apr 2011. However, out of goodwill, prizemoney was given out to stakeholders until “Love Academy” was put down due to his left knee that gave in after coming in fourth for his last run on 23 Sep 2011. 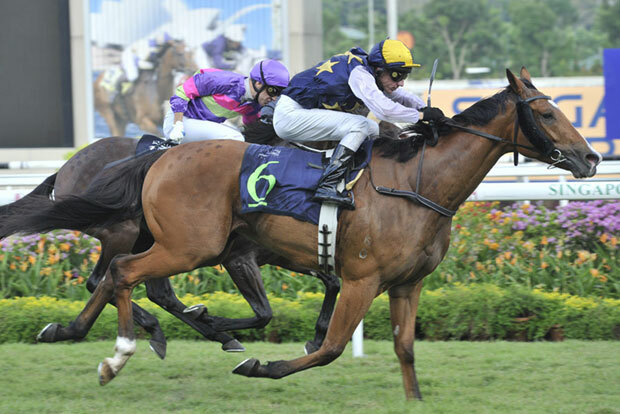 • 31 July 2011 – Congratulations to Mr Bernard Lee of Horizon Stable for the win by "Always Certain" in the $300,000 Group 2 Chairman's Trophy 1800m. After a few unlucky featured races, Mr Lee suggested a change of jockey for "Always Certain" for that race to have a "change of luck". "Always Certain", a horse bought for $60,000 at the 2008 Magic Millions Gold Coast Yearling Sale, had a smart win of 1min 48.16secs for the 1800m on the Long Course. Congratulations to Mr Bernard Lee of Horizon Stable for the win by "Always Certain"
• 9 July 2011 – Special Offer - TOAST and Equinome Limited have extended the special rates of 425 Euro for the Equinome Speed Test Gene Test and 700 Euro for the Equinome Performance Test. These tests are designed to gauge the level of a horse’s ideal running distance and its ability for performance. • 14 May 2011 - 24 Dec 2011 – TOAST recommended STC to use thermal barrier paint for STC stable roofs to reduce the temperature in the stable for a better, cooler living environment for horses to optimize their performances. STC is in favour of our proposal and is planning to trial the paint by covering 1 roof only as initial test. STC is currently reviewing the tender for roof painting for the trial. Since then, STC has approved the tender in Feb 2012. • 14 May 2011 - 1 Dec 2011 – TOAST application to STC for Mr Matthew Palmer to be TOAST stable jockey was rejected despite Mr Palmer having a family background well established in racing, with his father being a steward in Queensland Australia and a former champion jockey. It was emphasized that Mr Palmer is a person with integrity, honesty and ability to better the sport of racing here in Singapore. TOAST appealed for Mr Palmer, adding on that he is highly recommended by Australian trainers John & Helen Page, David Chester of Magic Millions, Satomi Oka JBBA /HBA Representative Japan among others. Moreover, we require a jockey who can educate the horses and give honest and appropriate feedback. An independent panel was set up to review the granting of Club Jockey License to Mr Palmer. The independent panel concluded, without asking for our testimonial for Mr Palmer, that the rejection of application by STC was correct without supporting reasons and the composition and chair of the independent panel was not revealed. • 16 Apr 2011 – TOAST thanks Mrs Lily Ho for the preparation of the TOAST Statement of Accounts for Year of Assessment 2011 and members Mr Christopher Joseph and Mr Peter C. Ugland who volunteered to audit the accounts for Year of Assessment 2011. • 13 Mar 2011 – Congratulations to Mr Tang Weng Fei of Jupiter Stable for a record-breaking win by “Better Than Ever” in the $200,000 Group 3 Polytrack Mile Championship 1600m. Despite having a slow start, “Better Than Ever” came up to the horses ahead of him on the outside only at 500m and finally emerged the winner. 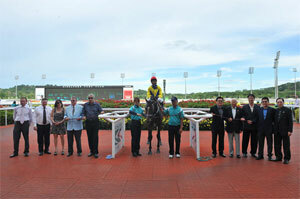 “Better Than Ever” won the race in 1min 37.69 secs, lowering Abdicate’s previous record of 1min 38.24secs by 0.55 seconds. Jockey Saimee expressed that polytrack is not his best surface but to finish the way he did in record time goes to show what a good horse he is. 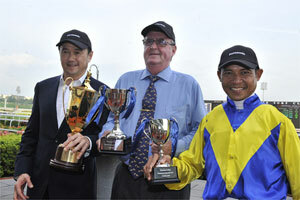 Congratulations to Mr Tang Weng Fei of Jupiter Stable for a record-breaking win by "Better Than Ever"
• 6 Mar 2011 – RDA at the Races was once again a great success with $114,500 being raised for the RDA of which TOAST and President Constance Cheng sponsored a gold table valuing $5,000 ($2,000 and $3,000 respectively). A silent auction was held and TOAST President Constance Cheng was the lucky bidder on an autographed Frankie Detori photograph which went for $2,000. The auction raised $6,000 and was donated to the NZ Red Cross Earthquake fund. • 26 Feb 2011 – TOAST provided our feedback to STC, Magic Millions and William Inglis to arrange the 2yo races from Apr to Jul rather than from Feb to May for next year's event to provide more time for early 2yo to develop and thus have more representative quality 2yo running in the races. This will also reduce the number of 2yo breakdowns which is a significant factor in Singapore since there are very limited rehabitation/spelling stations unlike in Australia where they have the facilities for 2yo to have race-spell-race-spell kind of trainings. However, this proposal did not gain the support of STC. The second year of the race scheme for 2yos has commenced in Feb 2012. It seems like this scheme is not proceeding smoothly as the 1st race started off with four 2yos on 19 Feb 2012 and there was no betting for the 2nd race on 2 Mar 2012 as there were only three 2yos. 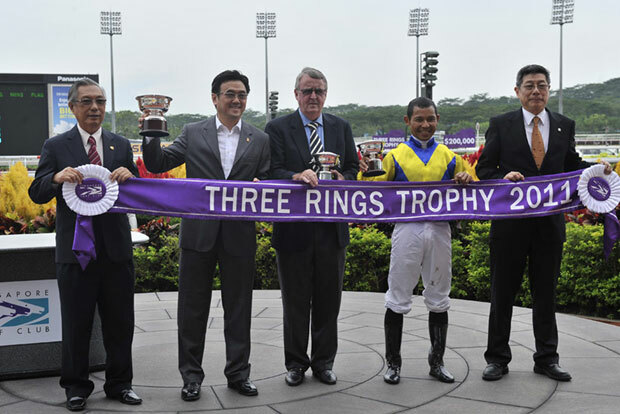 Congratulations to our Singaporean owner, Mr Tang Weng Fei of Jupiter Stable, for the win by ï¿½Better Than Everï¿½ in the Group 3 Three Rings Trophy. • 17 Jan 2011 - 9 Feb 2011 – TOAST, together with the huge support from Association of Racehorse Trainers Singapore (ARTS), trainers, owners and his fellow veterinary staffs, gathered 28 Letters of Support and Reference, to assist in the appeal for the renewal of contract for veterinarian, Dr Eugene Reynders, but to no avail. Dr Reynders’ services have been highly regarded by trainers and his peers respect him for his outstanding mastery of advanced equine surgical techniques, good work ethics and likeable personality. One of his achievements was the saving of the racing career of our top international horse “Rocket Man”. Unfortunately, STC insisted in the non-renewal of Dr Reynders’ contract for reasons that they classify as confidential. STC assures that they will continue to provide the best possible veterinary services.